There were 142 press releases posted in the last 24 hours and 153,319 in the last 365 days. Nearly 350,000 donated diapers, as well as feminine hygiene products, toilet and tissue paper, and paper towels, are being distributed to West Virginia flood victims. 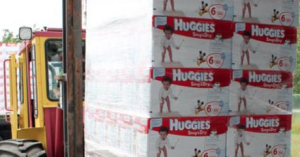 Nearly 350,000 donated diapers, as well as feminine hygiene products, toilet and tissue paper, and paper towels, are being distributed to flood victims. NDBN is coordinating with our member diaper banks, supporters and corporate donors to mobilize the delivery of much needed baby diapers and basic need items. NEW HAVEN, CONNECTICUT, UNITED STATES, July 1, 2016 /EINPresswire.com/ -- In response to the devastating floods impacting communities in West Virginia, the National Diaper Bank Network (NDBN) is activating an emergency response effort to help infants and toddlers, and their families. To date, NDBN has confirmed that nearly 350,000 donated diapers, as well as feminine hygiene products, toilet and tissue paper, and paper towels, are being distributed to West Virginia flood victims. Two NDBN-member organizations in West Virginia are working in local communities at the present time. Charleston-based Diaper Drop Charities has distributed 40,000 diapers to seven locations, including schools and health departments, thus far. Likewise, the Lewis County, WV Diaper Bank (Weston, W.Va.) is availing its resources to help families in urgent need of diapers. In addition, NDBN member organizations in neighboring states are adding significant numbers of diapers to the effort. Through the initiative of the Toms Brook Volunteer Fire Department in Shenandoah County, Va., A Small Hand has delivered more than 90,000 diapers to relief organizations in Lewisburg and Belle, W.Va. Plus, the Columbus Diaper Bank (Columbus, Ohio) is sending a shipments of donated diapers to West Virginia communities. NDBN is also working with fellow nonprofit organization Operation Compassion to help warehouse and deliver diapers and basic need items into impacted communities in West Virginia, now, and continuing through the recovery efforts in the months ahead. For more information on how to support NDBN and its efforts to help families affected by the floods in West Virginia, log on to www.nationaldiaperbanknetwork.org. About the National Diaper Bank Network: The National Diaper Bank Network (NDBN) is a nationwide nonprofit dedicated to eliminating diaper need in America, by leading a national movement to help meet the basic needs of all babies and their families…including access to clean, dry diapers and other material goods. Founded in 2011 with the support of Huggies®, the network raises national awareness of diaper need (#DiaperNeed) and supports the development and expansion of diaper banks in communities throughout the country. Its active membership includes more than 315 diaper banks, diaper pantries, and food banks located in 45 states, the District of Columbia and Guam. More information on NDBN and diaper need is available at www.nationaldiaperbanknetwork.org, and on Twitter (@DiaperNetwork) and Facebook (facebook.com/NationalDiaperBankNetwork).